Residents rotating in cardiothoracic anesthesiology at Montefiore Medical Center train at a leading academic medical center nationally renowned for its pioneering approach to comprehensive cardiac and vascular care. Our clinical innovation has led to the establishment of the Montefiore Einstein Center for Heart and Vascular Care, a Center of Excellence. We are one of the original seven members of the National Institutes of Health's National Heart, Lung and Blood Institute (NHLBI) Cardiothoracic Surgical Trials Network (CTSN), conducting clinical trials and serve as a model for cardiac surgery centers nationwide. Montefiore offers an enriched training environment for the next generation of anesthesiologists who will advance the field of cardiothoracic anesthesia. Residents are trained in current technologies such as transesophageal echocardiography (TEE), surface ultrasonography for vascular access, and advanced optics for airway control. They also care for patients in a state-of–the-art hybrid operating room that allows for performing combined surgical and interventional procedures. Montefiore continues to integrate the latest technology into daily practice, providing cardiothoracic anesthesia residents with the opportunity to use the most sophisticated tools and treatments. Annually, residents participate in the care of approximately 1,000 cardiac surgical patients whose care involves the use of the heart-lung machine. Residents can take an elective in basic transesophageal echocardiography to acquire the knowledge and caseload that will qualify them to sit for the Basic Certification Examination in Echocardiography. In addition, fellows will perform approximately 350 comprehensive echocardiography exams, qualifying them for advanced perioperative echocardiography certification. Our faculty have achieved national and international recognition and demonstrated their expertise globally. They have had a direct impact on the field, co-authoring the guidelines and standards of care that pertain to the cardiothoracic anesthesia and surgical community. These physicians also hold international leadership positions in cardiothoracic anesthesiology while advancing this unique and evolving discipline. The residency program, accredited by the Accreditation Council for Graduate Medical Education (ACGME), includes didactic weekly conferences, interactive echocardiography and case conferences, teaching opportunities, and research options. The cardiothoracic anesthesiology fellowship offers three ACGME-accredited positions and provides a rich clinical experience. There is dedicated time for academics and experience in the echocardiography laboratory, in addition to two months of electives and a month of critical care medicine. Research in cardiothoracic anesthesiology includes the study of pharmaceutical agents and TEE techniques that will improve the care of cardiac surgical patients. 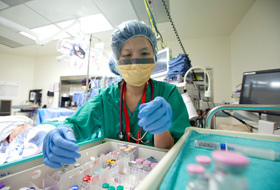 Projects range from investigator-initiated work to NIH-funded projects with surgeons. Addressing the increasing emphasis on the anesthesiologist's role in perioperative medicine and critical care, Montefiore will keep raising the bar for resident and fellow educational opportunities in cardiothoracic anesthesiology. Montefiore will continue to create research opportunities in cardiovascular anesthesiology and evolve its clinical practice to maintain the highest quality care for cardiothoracic surgical patients.